Hello everyone, have you been admiring the popup cake cards made with the Sizzix XL die but don't have a Sizzix Big Shot or the XL Die? 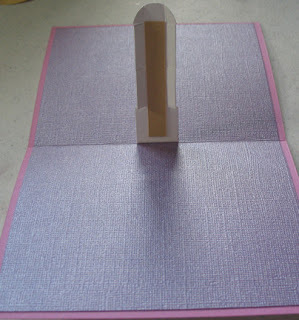 I'll show you how to make the pop up card without the special die! 1) Cut 3 circles in the following diameters: 3", 2 1/2" & 1 1/2". I used a Petite Circle Nestability set but you could use a coluzzle or other circle cutting system. I used the dies pictured on the left. 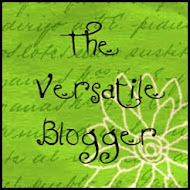 Be sure to cut it out of sturdy cardstock like Stampin' Up! colored cardstock. Flimsy cardstock will not hold the shape of the card very well. 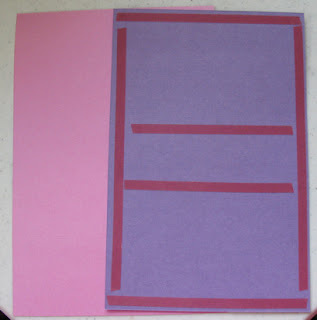 2) Cut 2 pieces 2 7/8" x 1/2" out of sturdy cardstock. Cut 2 pieces 2 5/8" x 1/2" out of sturdy cardstock. Cut 2 pieces 2 1/8" x 1/2" out of sturdy cardstock. These pieces will be used to attach the circles to the inside of the card. 3) For the center support of the cake, cut a piece of sturdy cardstock (I used watercolor paper) or thin chipboard 3 1/2" x 7/8". Score at 3/8", 1 1/4", 2 1/8" and 3". Corner round the end with the 1/2" scored section. Place on the score board vertically and score at 1/4" from the rounded end down to the second to last score line as shown. Score down from 5/8" from the rounded end down to the second to last score line as shown. To reinforce the piece, cut 2 strips of cardstock 2 1/4" x 3/8". 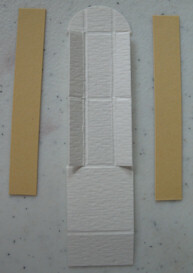 Glue the strips on each side as shown. 4) Score the 2 7/8" pieces as follows. 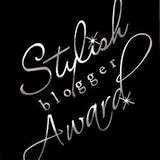 Place on a score board or Fiskars cutter with a score blade and score at 1/2". Rotate paper all the way around and score in at 1 1/2". The finished piece should have a score at 1/2" and 1 3/8". Score the other 2 7/8" long piece in the same way. 5) Score the 2 5/8" pieces as follows. 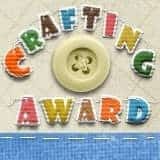 Place on a score board or Fiskars cutter with a score blade and score at 1/2". Rotate paper all the way around and score in at 1 1/4". The finished piece should have a score at 1/2" and 1 3/8". Score the other 2 5/8" long piece in the same way. 6) Score the 2 1/8" pieces as follows. 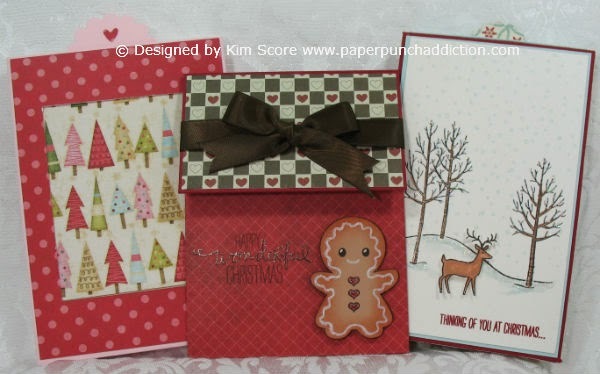 Place on a score board or Fiskars cutter with a score blade and score at 1/2". Rotate paper all the way around and score in at 3/4". The finished piece should have a score at 1/2" and 1 3/8". Score the other 2 1/8" long piece in the same way. 7) Place the largest circle on your fiskars cutter (or use a ruler and xacto knife). Line up the fold line in the cutting track. Lift the rail and position the cutting blade at 1 1/4". Lower the rail and drag the blade to 1 3/4". 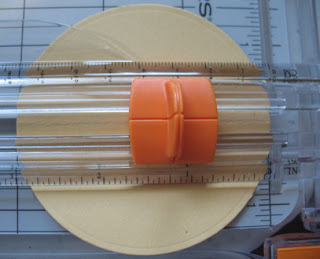 8) Place the second largest circle on the fiskars cutter. Line up the fold line in the cutting track. Lift the rail and position the cutting blade at 1". Lower the rail and drag the blade to 1 1/2". 9) Place the smallest circle on the fiskars cutter. Line up the fold line in the cutting track. Lift the rail and position the cutting blade at 1/2". Lower the rail and drag the blade to 1". 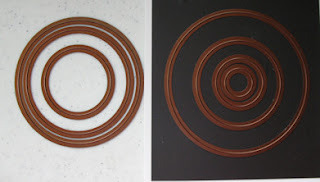 All 3 circles should now have a 1/2" slit in the center on the fold line. This is where the cake support piece will be threaded through. 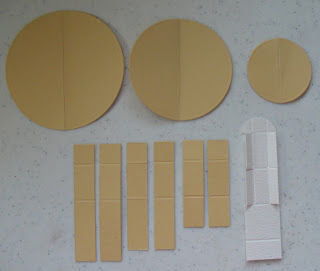 10) Use a strong adhesive like sticky strip and attach the scored strip pieces to the appropriate circles. The 2 7/8" pieces go with the largest circle. The 2 1/8" pieces go with the smallest circle. The scored section that is 1/2" wide is the end that is taped to each side of the circle at the center point (opposite to the fold line). 11) Add sticky strip to each scored section of the strips attached to the circles. DO NOT do one continuous line of tape along both scored sections. They must be cut apart. 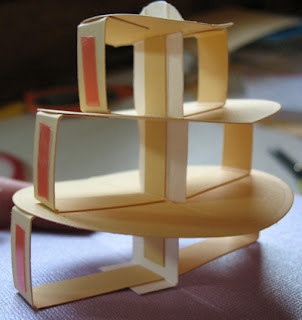 12) Create your base for the card. It needs to be nice and sturdy. 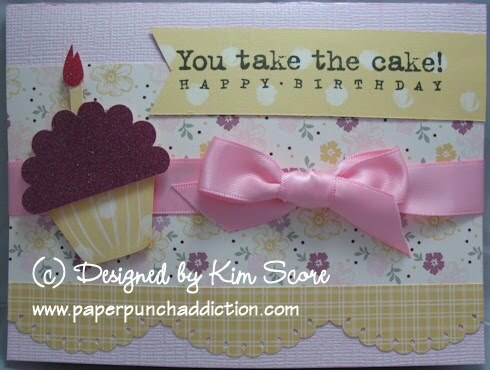 I layered 2 pieces of cardstock on top of eachother and then scored down the center. Don't score 2 pieces and then try to tape them together. You will get some pulling and the paper won't lie down right. 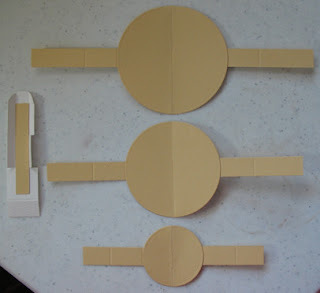 The base pieces of cardstock are 8 1/2" x 5 1/2" and 8 1/4" x 5 1/4". Use a strong adhesive to attach the layers together. Then, score at 4 1/4" or fold card in half and sharpen fold with a bone folder. 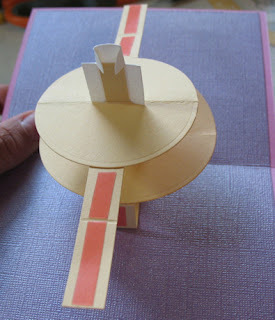 13) Attach the center support piece to the center of the card. Line up the 3/8" scored fold at the center of the card attach with sticky strip as shown. 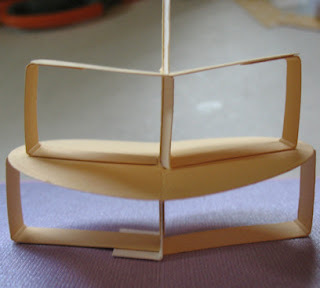 14) Fold in the 1/4" scored sides and hold in place. Thread the largest circle onto the support through the center slit. Slide the piece down past the first 2 scored sections until you hit the last scored section where you can't slide it down any further. Open up the folded tabs on each side of the section above where the circle is resting. The 2 attached strips will fold down and under the circle and attach to the card base as shown. 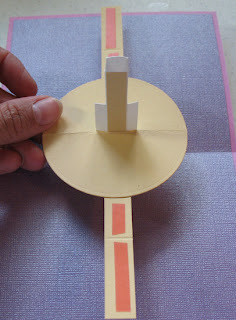 15) Slip the next largest circle onto the center support piece and slide down to the folded out section. Fold out the tabs above it to lock into place. The 2 attached strips will fold down and under the circle and attach to the top of the largest circle at the center, as shown. 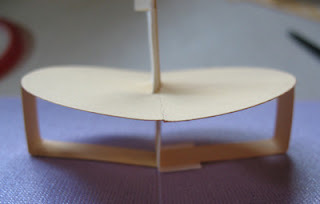 16) Slip the smallest circle onto the center support piece and slide down to the folded out section. Fold out the tabs above it to lock into place. The 2 attached strips will fold down and under the circle and attach to the top of the circle below it as shown. 17) Cut 3 strips of designer paper. Thinner paper works better because it easily folds and opens when the card is closed. For the bottom cake layer, cut a strip 10" x 1". For the middle layer, cut a strip 8 1/2" x 1" and for the top layer 5 1/2" x 1". 18) Secure one end of the longest strip to one of the folded pieces on each side of the bottom circle. Carefully wrap the paper around the circle. Be sure not to pull the paper under the circle. Have it just resting against the edge of the circle. Be sure to fasten the paper on the piece at the other side of the circle at the midway point around. Continue around the circle and tape in place back at the starting point. Repeat the same steps with the middle and top layers. 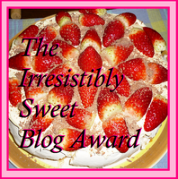 The finished cake will look like this. 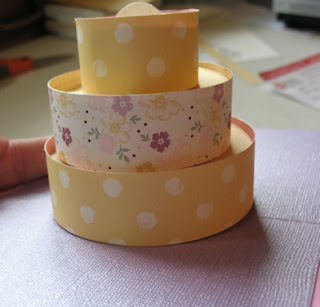 You can make a candle for the top of the cake or attach a ribbon like I did in the sample. When you fold the card closed, the cake should fold in on itself. The card will be bulky in the center. 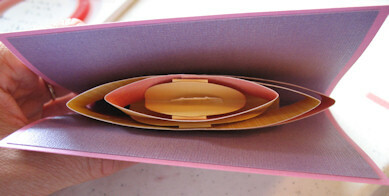 You can use a ribbon or make a belly band to wrap around the outside of the card to keep it closed. For my sample, I punched out some cupcakes and put a couple on the inside. 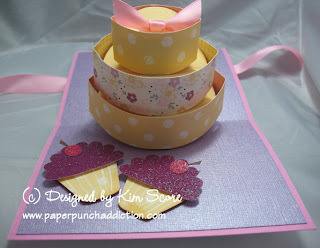 I decorated the outside of the card and used a ribbon to tie the card closed. 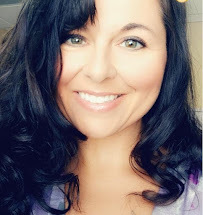 I hope you have some fun and try out this technique yourself! Thank you for all your time doing this tutorial for us. I can't wait to try it. wow! You are so patient. Thank you for your great tutorial. WOW, thanks for the great tutorial, I do not have the dies, but now I can do it, thanks again. Thank you for your great tutorial and the time to create this. I'm so excited to try it !!! I DO have this die, but it was super awesome of you to break it down & share it with peeps who may not have access to it, but would love to make it. TFS!